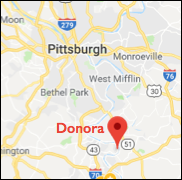 There’s a town along the Monongahela River, just north of the bright yellow Stan “The Man” Musial Bridge, called Donora. The old mill town is famous for being the “Home of Champions,” most prominently the aforementioned baseball legend, plus Ken Griffey, Sr. and his son, Ken Griffey, Jr, who was born in Donora but moved with his parents to Cincinnati when he was six. The Musial and Griffey homes are located uphill from the main drag, McKean Avenue, which runs along the flood plain next to the Mon, as locals call the Monongahela. When I say uphill, I mean it. Pretty much all the roads emanating from McKean upward are rather steep, particularly 5th Street, part of which was closed off years ago because it proved too dangerous for car travel. On 5th Street now, between Prospect and Murray Avenues, there is a street-wide swath of grass with a set of stairs on either side. The stairs on the right, looking upward, are replacement stairs installed a number of years ago. The stairs on the left, however, are original and tell an interesting story. Each riser, from the very bottom to the very top, is but 4 inches tall. Most stairs today have risers about 8 inches tall. So why do the 5th Street stairs, and many other staircases in Donora, have risers half that height? It turns out that Rose Marie Iiams’ grandfather-in-law was the engineer who designed the stairs. Mrs. Iiams, 90, was a long-time pharmacist in Donora and worked all day, every day during the 1948 smog event. The story she tells may be apocryphal but it’s adorable nonetheless. “Women were wearing hobble skirts then,” she says. I didn’t know what a hobble skirt was, so she kindly explained. “The skirts were sort of tight, so you couldn’t raise your legs very far.. It is indeed, Mrs. Iiams, it is indeed.